We have had a consistent thread running through our celebrations lately, and that is not celebrating on the exact day – but boy do we celebrate! We’ve got our own calendar going! We celebrated Easter Sunday on the Saturday before, Zach’s birthday (which is July 10th – but he’ll be in Europe for the summer) on May 10th and Mother’s Day for us was a week later as we had to travel to Boston for business on the actual holiday. My boys, with the help of one girlfriend, once again made a spectacular meal using recipes from Jamie Oliver, Mark Bittman, and the Chocolate Covered Katie blog. Not too shabby, right?! 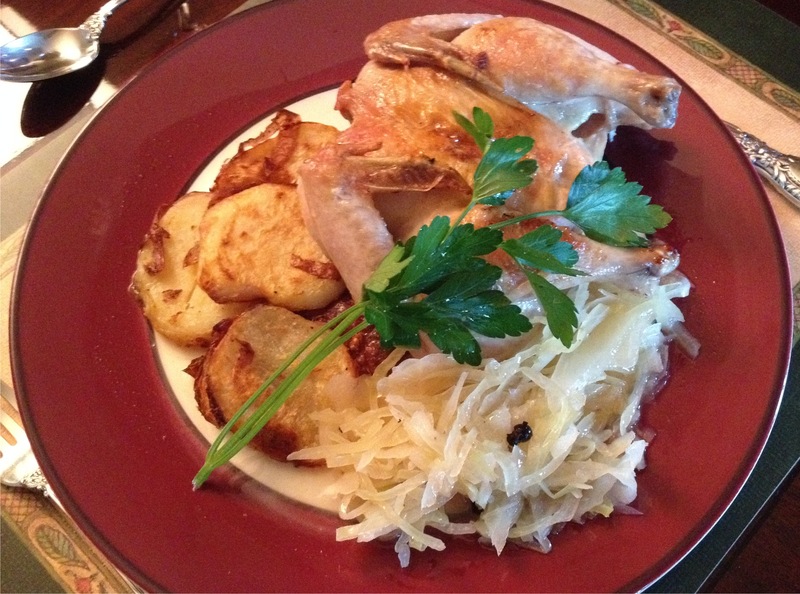 The standout main dish, unusual but terrific, was Bittman’s Cornish Hens and Sauerkraut recipe. My boys always ask what I want and I promptly say, “Surprise me!” I like/love nearly everything except processed food and of course they’re not going to go there because after all, they were raised by me. When the older one texted me to ask if I had juniper berries at the apartment, I knew I was in for something great. I LOVE juniper berries – as I love my gin martinis on a Friday night! The next course (yes, we have courses!) 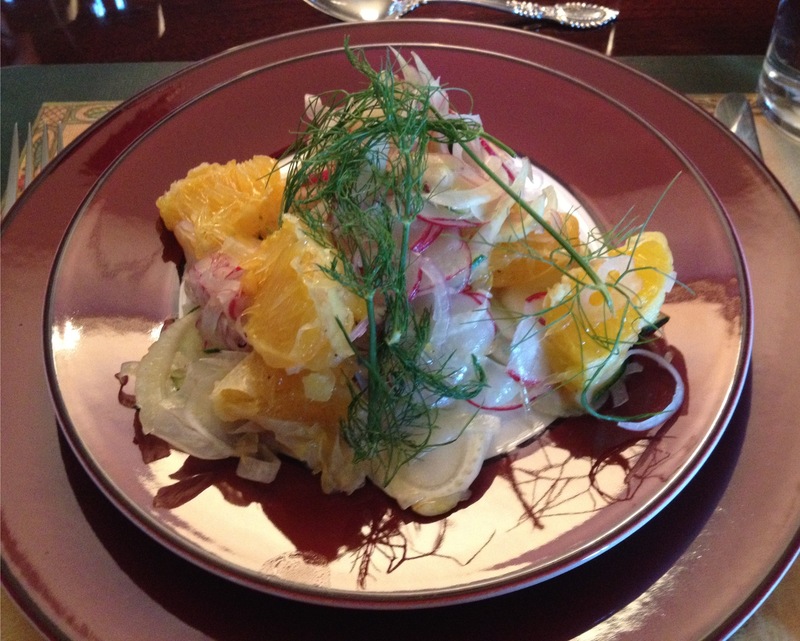 was this amazing salad of really unusual ingredients – fennel, red onion, cucumber, radishes and oranges. Yes oranges! They provided a wonderful refreshing burst of flavor! Here’s the complete recipe – they did not use the ice cubes. INSALATA AMALFITANA Amalfi Salad – Adapted from Jamie’s Italy. Remove the ice cubes. In a bowl, mix together 2 tablespoons of good herb or red wine vinegar and about 6 tablespoons of extra virgin olive oil. Mix well, and taste. If your oranges are super sweet, you may want some extra vinegar. Add salt and pepper to taste. Toss the salad with the dressing, then add the orange segments with their juices. Sprinkle the reserved fennel tops over the salad right before serving. And then we had the amazing main course of the Cornish hens with sauerkraut served with some sliced, crispy roasted Yukon gold potatoes. An elegant but straightforward dish and an excellent introduction to sauerkraut. But steer clear of the canned stuff; instead, look for a bottled brand that contains no more than cabbage, salt, and water. This preparation also works well with pheasant, chicken, and duck. Remove the backbone of the hens by cutting along their length on each side. Separate breast and leg quarters. Cook the bacon over medium heat in a large, deep ovenproof skillet until crisp, about 10 minutes, or heat the oil until it shimmers. Remove the bacon with a slotted spoon and reserve. Add the hen pieces to the bacon fat or olive oil and brown them on all sides. Meanwhile, rinse the sauerkraut in a colander and heat the oven to 300°F. When the bird is nicely browned, add the sauerkraut, cloves, juniper berries, thyme, bay leaf, and white wine to the skillet. Cook over medium heat until about half of the liquid has evaporated, about 10 minutes; move the skillet into the oven. Bake for about 30 minutes, stirring occasionally and adding liquid as needed to keep the sauerkraut just moist, until the legs are tender and the sauerkraut is slightly browned. Remove the skillet from the oven, then remove the cloves and bay leaf. Taste the sauce, adjust the seasoning, garnish with the bacon pieces (oops – they forgot that) and serve hot or warm. 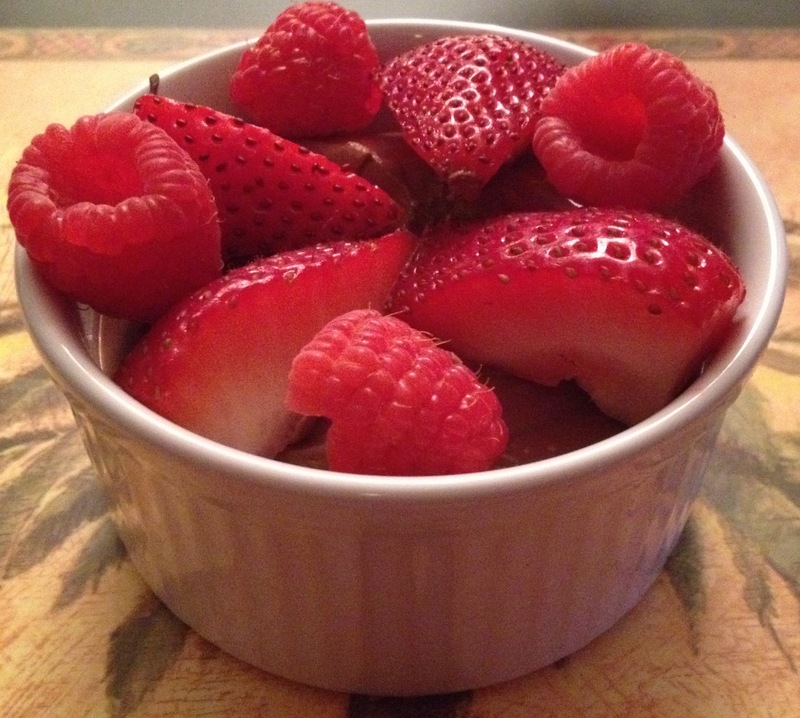 And for dessert, they made this amazingly rich, decadent chocolate mousse topped with fresh raspberries and strawberries, that had this secret surprise ingredient that not one of us could guess – it was tofu!!! Yes tofu was used instead of cream. Can you imagine? 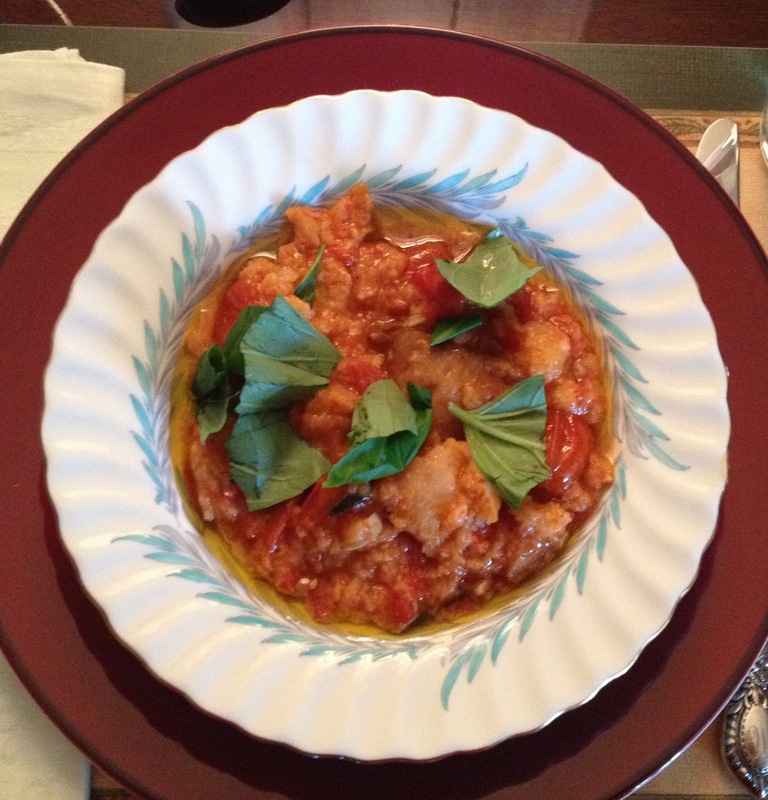 It was delicious – and no doubt a whole lot healthier for you! 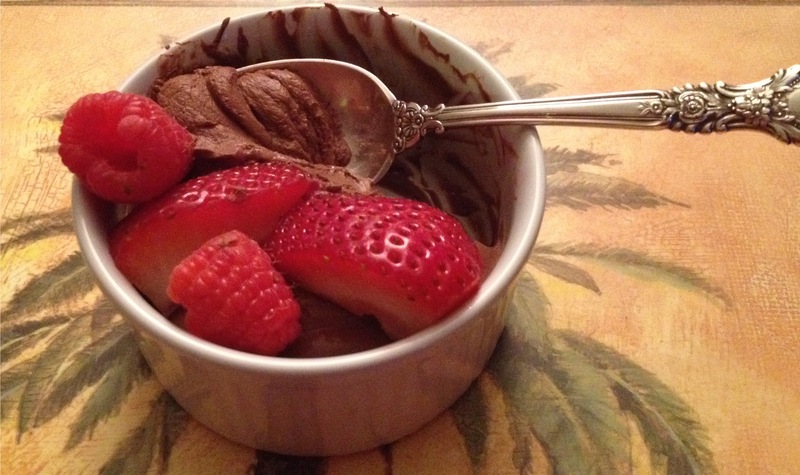 Here it is from the Chocolate Covered Katie blog. She apparently specializes in healthy chocolate desserts. How cool is that?! I couldn’t eat the whole thing! I know I’m lucky. Hope all you moms out there enjoyed a fantastic Mother’s Day, filled with LOVE too! No, not too shabby at all, Mary. I’d go for that chicken with sauerkraut first! LOL – but of course – you guys LOVE sauerkraut!! I’m very much looking forward to the day that my 2 boys prepare us a 4 course dinner, just like yours do Mary! Absolutely fabulous! Margot – you’ll get there – quicker than you think! I can’t believe how old my boys are and it seems like all of a sudden! It must be wonderful to be feted like this on Mother’s Day. You are deserving of all the attention. What a wonderful meal! What a lovely dinner, Mary. You must be proud that your boys can cook such a fabulous meal. I am – and truly, they’re becoming better than me – and they’re fearless!! Everything looks wonderful, I love that you are not married to celebrating on the exact day. You are so lucky to have such a lovely doting family. What a treat, Mary! You are so loved to be presented with a fabulous gourmet meal like that! I know – I am so lucky!! 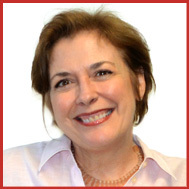 Wow, Mary Frances. This meal is decadent and just the way I like to eat because it’s also light. So full of Almafi flavors and culture. I love it. I also love not celebrating occasions on the day. There’s something about being able to enjoy them when you get to them. What a lovely cornish hen and that salad! Wow. Thanks Amanda!! It was really very special!! Oh wow!! The boys sure know their Mom! The spread looks divine. I think I’d pass out if my boys made such a magnificent meal! Lucky you!! And fun tip about tossing the salad with ice cubes! They might bring home that George Foreman grill and surprise you one day!! And yes, Jamie always has some neat tricks! everything looks delectable 🙂 We are behind in celebrations most of the time but that has to do with coordinating between the children and their plans. I know Tandy – life is SO busy!! Thank you Rakesh and Swikruti – you are so sweet! It was a very lovely treat! Very nice!! You are quite lucky!!! I know… thank you Mimi!!! Oh my these look so good! I bet salmon would be good cooked this way as well! Hmmm – that’s an interesting thought! Wow your kids are amazing, what a feast for their awesome mom. It looks like a great meal, Mary. It was divine Angie!! Thank you! What a fabulous and impressive meal! Your boys must be very good cooks! I can get my daughter interested in cooking, but never my son. Well Christin you never know – his interest might show up later. I know it did with our younger one. When they’re on their own and have to figure out how to eat just as well as they did when they lived at home, then they’ll rise to the occasion! BTW – I roast my corn like you do too! It’s the best!